Have your breakfast facing the sea! 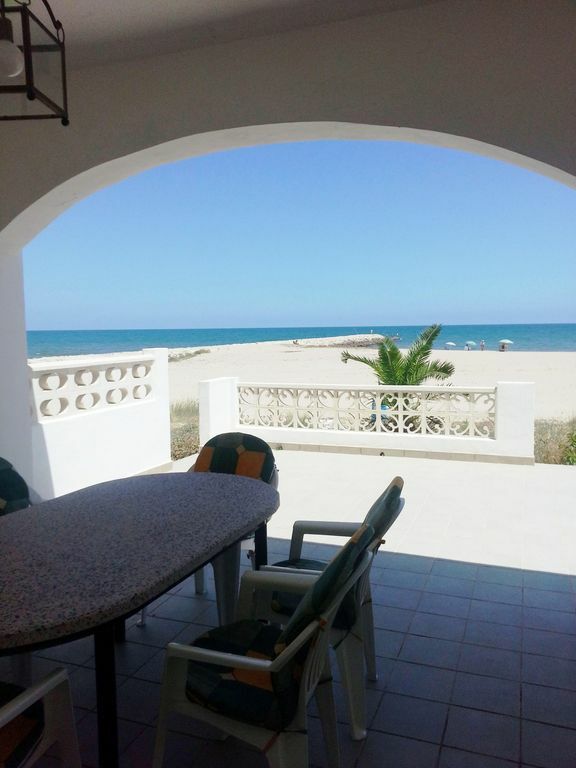 This ground floor attached house in Denia, situated on a first line of beach with sea view, has 3 bedrooms, a living dining room with opened fitted kitchen and a shower-room. Covered terrace facing the sea. it is in a quiet area. The accommodation is equipped with the following facilities: garden furniture, terrace, iron, internet, open-air car parking, tv. The vitroceramic open plan kitchen, is equipped with refrigerator, microwave, oven, freezer, washing machine, dishwasher, dishes/cutlery, kitchen utensils, coffee machine, toaster. Denia is located on the Costa Blanca, between Valencia and Alicante. It is the ideal place to discover this part of Spain, the coast as well as the beautiful inland valleys and mountains landscapes and villages. From Denia you can also sail to Ibiza or enjoy Benidorm´s theme parks. Denia offers 20 km of coast with quiets waters that invite you for a swim or for a dive. Beaches with sand, rocks, coves, many of them with Blue Flags of the clean Seas of Europe. Denia is one of the best place in Spain to practice windsurf, diving, sailing, and it offers facilities to practice many nautical sports as well as others like golf, tennis and so on. Denia offers many possibilities like shopping, going to “La lonja” the typical fishers market place, visiting the castle, walking in the prestigious area of the Montgo Natural Park with fantastic views to the coast. Denia is a gastronomical city. You will find a typical Mediterranean cuisine made with healthy and fresh ingredients from this area like tapas and countless ways to prepare rices like the famous “paella”. To achieve unforgettable holidays, enjoy the animated nightlife, or discover the Spanish way of celebrating life going from one fiesta to another. The pictures that you don’t see. This property is towered over by a huge apartment block. It is like living in the garage of it. Car fumes in all of the bedrooms as it is so hot that you have to have the windows open. With about 21 balconies all looking you way with all of the noise that comes with that. Such a shame it has a lovely spot on the beach. If we had seen a photo we would never have booked it. Sehr schönes Apartment für Familien oder Paare. Sonnenliegen auf der Terrasse wären wünschenswert. Der Abfluss der Dusche ist sehr schnell überlastet. Erstkassiger Blick aufs Meer ! Unter der Woche hat mann den Strand fast für sich allein ! Sonnenliegen wären schön gewesen und ein Grill muß unbedingt noch auf die Terasse.